How many people desire to add an author information box to their websites that usually appears at the end of their posts? WordPress has lots of plugins for author box that does the job pretty handsomely. There are also many author gadgets available for Blogger, but they are neither for multiple authors nor do they support post counts. Since, our previous author box was out-of-date. Therefore, we thought to create a robust author information box that could fulfill all the needs of a website. We have used a jQuery file that fetches your pictures and further information from the Blogger Profile. Therefore, today in this article, we will learn How to Add Author info Box with Post count in Blogger. How To Install Author Info Box in Blogger Posts? The steps are straightforward for those who know a little about basic HTML because during the tutorial we would also show you how this widget would fetch the Images from the Blogger’s profile. Consider the following instructions. Step#1: Go To Blogger.com >> Template >> Edit HTML >> Proceed. Before, we move ahead it is essential to expand the Widget Box. On the top left corner of your screen, there would be a Small Check box just select (Tick) it and proceed to the next step. Step#2: Now within the template’s coding search for the ]]></b:skin> tag and just above it paste the following CSS coding. Since, everyone likes to customize the gadget according to their color Scheme. Therefore, to do modifications consider the following options. For Background Color: Replace #222222. For Font Color: Replace white. Replace Syed Faizan Ali with your Blogger display name. Remember: The name should be written as it is shown on Blogger Profile. Remember: The name which are adding, should be in the list of authors of the blog. Replace Information_Here with the small biography of the person who has written the article. Make sure it should not exceed more than 15 to 20 words. Replace Profile_Url with the profile URL of your blogger's Profile. Remember: Its not must that a person should add the URL because the whole data is fetch through the username. All Done: Now after customizing the gadget it’s time to save the Template by pressing orange “Save Template “button present at the bottom of your screen. That is it, now visit post pages of your site and at the end of each and every article it would display an incredible "Mr.Editor Box. To be honest, this gadget is one of the greatest inventions of our Developer team. The most prominent feature of this gadget is post count that updates on automation. We are working on more widgets that work on automation. Some more marvelous widgets are scheduled so keep your fingers crossed. What are your thoughts about the author box? Point out the things that need an improvement. Take a lot care of yourselves till then, Peace, Blessings and Happy integrating. great work ali bro, you are doing very good. is it miltiple author box? Will it work with any author? I mean, if someone posts on my site, then would it automatically show? Yes, You have to add Scripts for all the authors. And with the Help of b:if conditions you can show the author box only in the specific posts. Hope that helps. Thanks. But I am a bit confused, how do I add author box for multiple authors? Is it counting post automatically or need to put post count number manually? Whic profile url need to use blogger or G+? No there is no need to update post counts manually. It updates them on automation. i am talking about blogger profile. This is awesome. But what if I wish to get multiple author profiles. I mean, If a person has more than 3 moderators on his site and how can we get separate author bios for all the authors on their respective posts? can you show to me about the b:if author conditions ? Excuse me for my bad english please. I Guess this doesn't works on Default blogger templates. I Didn't find the code on your site. I can only SEE CSS on your site. Please apply the full tutorial . what to do if i have Many Authors?? how to change the width of the box? There is no option in blogger to expand widgets what to do now?? There is no need to use this option as it is removed. Just search directly. A suggestion would be to make this Author Box for a blog where there are more than 1 author who writes articles on the blog. 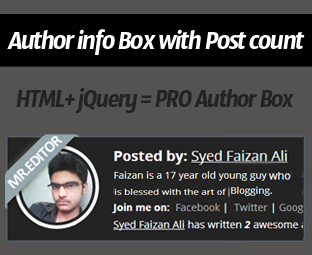 Hi Faizan Bhai I follow all steps but in my blogs it does not showing author box plz help me.